Last night’s first SWOG evening walk of the season was followed quickly by the first of Andrew’s ‘Deepest Cheshire’ evening strolls. The chosen meeting place was the Egerton Arms in Chelford, and tonight we all knew each other, with seven of us representing a good turn out by the standards of these particular ambles. The sun looked low when we set off soon after 7.30, but we managed the 8 km (5 mile) circuit in a bit less than two hours, finishing at dusk but with no need for torches to be deployed. Probably none of us had one anyway. Narrow lanes and boggy bridleways, with a few footpaths through fields, provided our rights of passage tonight. We should be grateful that the English countryside has retained these ancient rights of way that in other parts of Europe and elsewhere in the world have been rendered out of bounds to anybody but the landowners. Mallorca is an example – one of the walks Sue recently embarked upon, based on a recent guidebook description, had been well and truly barred by such an owner, with no legal comeback available in Spanish law. No such problems in Cheshire apart from the occasional ploughed field and inappropriately positioned electric fence…. Beyond Colshaw Hall, in the upper class surroundings of Fourlane-ends, this pleasing image of a horse and dog has been sculpted from an old tree trunk. Chelford Lane saw tonight’s squad posing in the half light before the sun finally disappeared. As we peered over the fence, Gerald leant over and snatched Andrew’s map. In the background we could hear Gordon chuckling and Tony purring. There was no incentive to trespass into these grounds, which seemed rather like an annex to Chester Zoo. A little further on we passed another house with a slightly less harmful looking menagerie in its garden, though the Black Deer stag’s horns could cause quite a mischief to the unwary. We survived all this, and kept our distance from the prancing cows, thus returning to the spacious Egerton Arms for a pleasant pint (or whatever) before pottering back to the urban zoo of Greater Manchester. Here’s our route – 8 km, with minimal ascent, taking rather less than two hours. The remainder of Andrew’s ‘Deepest Cheshire’ strolls are as shown below – all about 8 km or 5 miles. Everyone is welcome to come along. * My ignorance concerning the sport of polo knows no bounds, my comments being complete guesswork. Apologies for any offence that may be caused. After enjoying the spectacle of our fleet of swifts arriving in our street to set up their summer quarters – good timing as there are suddenly plenty of insects in the warmer weather - we had the pleasure of joining Stockport Walking and Outdoors Group (SWOG) on their first evening excursion of the season, led by Marple aficionado Jack, on mostly familiar paths around Marple, principally the Middlewood Way and the Peak Forest Canal towpath. Luckily, there aren’t stiles on those sections, though the link over Marple Ridge did produce a few delays as it took some time to get 45 people and numerous dogs over or through a variety of obstacles, and through a field of horses on that section of the walk. It had been a lovely warm day, and it continued that way until well beyond dusk, by which time we were sipping pints of Unicorn in the Railway, chatting to ‘armless Tracey the ‘Scone Lady’, and commiserating with Manchester City supporters after their team had been dumped out of the Champion’'s League. Here’s our route - 9.5 km, 100 metres ascent, taking a little over 2 hours. Thanks to Jack for leading this well attended stroll. Progress is being made, with a temporary roof apparently being constructed, presumably to protect workers who will be renovating the Hall over the next couple of years. One of the ‘volunteer duties’ of the parkrun is the writing of a run report. It’s not essential, and Andy usually knocks one off, but as I was leaving the café this week, Jenn asked if I would oblige. So for the benefit of readers unfamiliar with ‘parkrun’, here’s a typical report. The photo at the bottom, of my attempt to chase down the legendary Jackie Cordingley, was taken from the finishing line by Roger Whitehead. The skeleton of the hall's temporary new roof glinted in a stray sunbeam behind a bright yellow crane as this week's 217 fitness fanatics, mud lovers and insomniacs assembled under Run Director Jenn's watchful eye. For several participants, this was the first stretch of their legs since last Sunday's London Marathon, in which a number of stunning performances from Wythenshawe parkrunners deserve a mention. Caroline Baba (4.57), Darren Cooper (3.42) and Simon Skentelbery (3.23) all excelled themselves. Jason Cundick (4.04) bettered the time he posted in the Manchester Marathon a couple of weeks earlier by over ten minutes. Sub 4 hours next time, Jason? Mark 'went off too fast' Hunter (3.13) came a magnificent 74th out of 1071 runners in his age group, and stalwart Run Director Andy Holloway just missed out on a sub 3-hour run, fading in the last mile and returning a time of 3.01, coming a more than creditable 131st out of 2346 runners in his age category. Well done Andy, you obviously gave it everything. This year's Wythenshawe star performer, albeit by a very narrow margin, was Madeleine Hill, who managed a remarkable time of 3.23, coming 127th out of 2490 in her age group. Well done Madeleine. 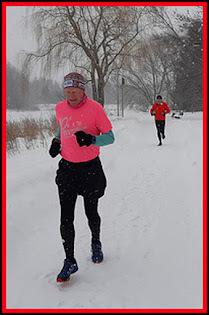 Dan Martell also deserves a mention: a) for his 2:59:58 Manchester Marathon, but also for cycling between Altrincham FC and Braintree FC in snow and hail and taking in Huntingdon parkrun (18.53 - 3rd position) on the way down whilst the rest of us were slogging through Wythenshawe's 'muddy passage'. Dan was raising money for Prostate Cancer and Altrincham FC. Parkrun HQ provides a plethora of statistics, worshipped by all our Run Directors, so here they are, with a few of my observations. This week's star of sequence and symmetry, in "pleasing time" corner, is Jo Racle, in position 66 with a time of 25.52. Well done Jo, that must have taken some planning! Daniel RACLE (JM15-17) of Altrincham and District AC, was first over the line in 18:31 - 13th time in 42 appearances. Steve GARDNER (SM25-29) (Unattached) was second over the line in 19:36. Harry SINCLAIR (JM11-14) of Altrincham and District AC, was third over the line in 19:40 - he was first to finish once before. Matteo MERCADINI (Unattached) 2791 pts. Jonathan BUTCHER (Unattached) 2390 pts. Jeffrey Mark CRITCHLEY (Unattached) 2300 pts. Bev JACKSON (VW50-54) of Altrincham and District AC, was first (21st overall) over the line in 22:36 - 9th time in 26 appearances. Jackie CORDINGLEY (VW55-59) of Sale Harriers Manchester, was second (36th overall) over the line in 23:33 despite feigning injury - she has been first to finish on 36 previous occasions. Beverley GOODWIN (VW55-59) (Unattached) was third (44th overall) over the line in 23:55. Beth EVENS (Unattached) 2756 pts. Emma WALKER (Unattached) 2364 pts. Abi RADFORD (Unattached) 2128 pts. Mark J HUNTER (VM55-59) was graded 78.39% for the time 20:17 (10th overall). Jackie CORDINGLEY (VW55-59), despite being injured, was graded 77.92% for the time 23:33 (36th overall). Frank CORDINGLEY (VM55-59), not injured, but unable to match his wife's performance, was graded a mere 76.39% for the time 20:07 (8th overall). This week there were 217 runners, of whom 22 were first timers and 38 recorded new Personal Bests. Representatives of 19 different athletics clubs took part. The 19 different athletics clubs are mainly local, but I did spot 'tourists' from London (Steve Gardner), Glasgow (Andrew Cruickshank), Winchester (Iain Cottingham) and notably the Event Director from Little Stoke (Becky Bushnell plus James) fresh from a trying couple of weeks with Stoke Gifford parish council. Greetings all, and we hope you enjoyed your visit. Talking of enjoying the parkrun experience and camaraderie, runners could do worse than join the already substantial numbers who drift into the nearby Courtyard Café for post run refreshments and a chat. All in all, it does get the weekend off to a most pleasurable start. Back to the stats from HQ - they reveal that Wythenshawe parkrun started on 6th August 2011, and since then 5,318 different runners, including participants from 316 athletics clubs, have completed 34,656 runs covering a total distance of 173,280 km, and there have been 6,410 new Personal Bests. The female record is held by Alison LAVENDER who ran in a time of 00:17:39 on 2014-11-01 (event number 160). The male record is held by Mark INCE who ran in a time of 00:16:21 on 2013-08-31 (event number 103). There are lots more numbers and sort facilities on the website - it's a haven for statistics geeks. If everyone volunteered THREE TIMES A YEAR, we would have more than enough. It's fun to do as well. M and D leave from Manchester city centre 5.15 pm. Pick up J at Carlisle. Stop at Black Bull, Moffatt, for a meal. Lovely evening and fine views - reach Pitlochry 10.30. Faskally campsite. Up at 6, away by 6.30, arrive Loch Mullardoch 9 am. Wait for Nick, who arrives at 9.55. Set off 10.15, heading for Carn nan Gobhar (CnG) (992m). Follow the loch for a while and then head up a stream (Allt Mullardoch). M appears to have too much in sack. Nick is disturbingly un-style conscious with an 11 year old sack. Only two straps! John has a new Karrimor Condor sack that is even more complicated than Dave and Martin's. Stop for break at top of stream. Tea all round. Cags on as v windy and drops of rain. Head off up CnG, which we get to after frequent stops. Visibility in cloud not so good. Overtrousers on for N,D and J (M's were already on - to the amusement of all as they look as complicated as J's sack). The next target is Sgurr na Lapaich (1150m) which is supposed to be a narrow ridge. Not the way we went - steep slope and a climb through snow were enjoyed by D and M. Nick not so happy (used his axe). J definitely not happy with our route. But J is a purist. Reach summit trig point around 4pm. Some were feeling tired, so we decide to camp at nearby lochan. Set off on compass bearing. But instead of going down to Loch Mor we go over the other side (to the south) just a brief way to pitch. This means we won't have to ascend as much in the morning. Tents soon up after a false start. Meals and plenty of sleep etc etc. This is Nick's return after a long absence - he hasn't really featured since Vol 1 of these diaries - this is Vol 19. After said 10 year absence some of Nick's gear is the subject of ridicule from his fellow walkers. His only new item is a stove, his last one having relaxed into a few unrelated rusty pieces. The day started clear and cold - it's impossible to button a shirt with frozen fingers! Left campsite at 8.30 having packed wet frozen tents. Regained the col in warm sunshine. Then a long hot climb with good views of Loch Beag and Loch Mor, to reach the An Riabhachan ridge. M burst through from the back to reach the summit first. We set off some time later to climb An Socach. The sun was out again and the views were excellent. Eventually reached the summit, where our two new friends with very small bags were relaxing in the sunshine. We sat and took in the awesome vistas - by now as far as the horizon in all directions. There were guesses at naming some of the Torridon tops in the distance. Descent was initially easy, over grassy slopes above Coire Lungard, but turning down steeply towards Loch Mhoicean the going became more difficult. Dave raced into the distance. J asked what was Dave's secret breakfast menu? I (Nick) went more slowly, my toe joints painful as my boots didn't expand in the right places. At Loch Mhoicean we stopped to sunbathe for a while before more descent down a reasonable track towards Iron Lodge. An excellent view, part way down, of a classic glacial valley. 'Iron Lodge' appeared to have stone walls and a partially constructed felt roof - we couldn't see any old iron anywhere! Further down the path to Carnach, M having persuaded us to avoid Mullach na Dheiragain, we passed sheep with fluffy white lambs for M to photograph, then a large herd of red deer and a herd of Highland cattle with calves. Crossing the Allt na Doire Garbhe by the bridge at Carnach (uninhabited but in good repair) we sat and pondered the climb ahead, managing to talk it down to 'only 850 feet'. We could see the stalkers path climbing steeply up by the Allt Coire Easaich (it wasn't easy) and its waterfalls. The path was good if steep until it disappeared, necessitating a vertical climb (really! - Ed) up a stony, grassy, gravelly gully. By this time I was far behind and was glad I'd managed to 'sell' my small spare gas cylinder to Dave earlier in the day. My feet were sore and my legs ached. J hung back a little to point the way and we landed up on the shore of Loch Lon Mhurchaidh at about 5 pm. It was a slightly damp and heathery site, but with good views across the loch towards A Ghlas Bheinn, Sgurr Gaorsaic and Sgurr nan Ceathreamhnan 'that most celebrated of West Highland peaks'. 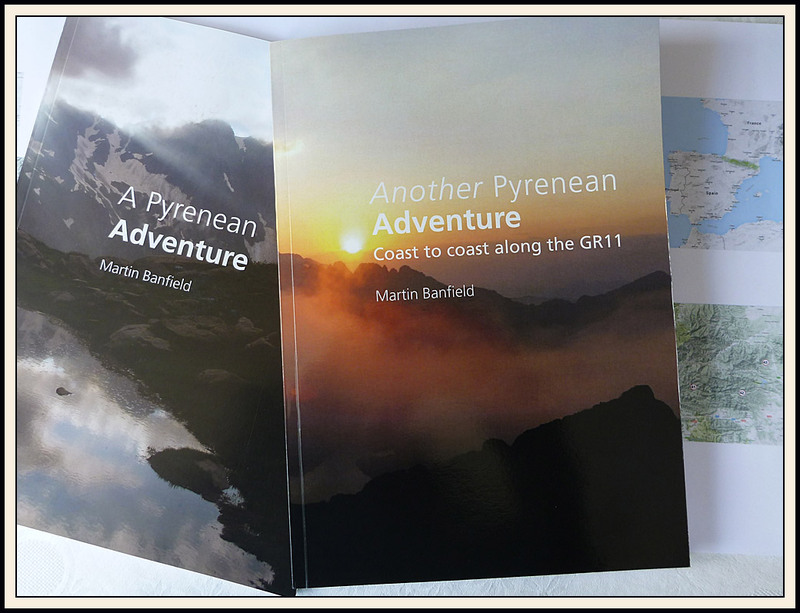 'A superb and complex mountain of many ridges, peaks and corries' ... 'in a very remote and wild situation'. We'll see about that tomorrow. Dave's stove has now completely given up, despite J's engineering skills, so D was resigned to borrowing to cook his evening repast. The only trouble with this site is there is no stream nearby, so good planning is needed to avoid an early morning hike. The sun's now disappeared and the wind has dropped. Good job it's too early in the year for midges! 6.30 reveille, away by 8 am. Frost overnight, but cosy on the heathery site. Wake to a blue sky and calm Loch Lon Mhurchaidh - ducks waddling gently across, fish catching flies, reflections of Ben Attow, views to Sgurr Gaorsaic and to our target, Sgurr nan Ceathreamhan (SnC). and eventually the path steepens, pointing us up the NW face of SnC before petering out. It was a long hard pull some 2500 feet up this hill, but the views from the summit, reached at about 11.30, made it all worthwhile. Met two people from Halifax on the way up. Brew stop on the summit, facing south with the Kintail peaks nearby and others, like Nevis, clear in the distance. whence we descended to Bealach Coire Ghaidheil for a welcome brew near a stream a few trifling feet beyond the col. J was having a bad day. He had just fallen over at the end of a snow slope and banged his knee painfully on rock. After recovering from his prostration he skilfully brewed up and then knocked over his tea, wetting things and burning his sore leg. Whilst he was fetching more water his stove, borrowed by D, succeeded in lighting the grass, and J's anorak came within a hair's breadth of destruction, saved only by D and M's quick thinking, which unfortunately used up the water and meant another trip for J, who found this brew stop somewhat exhausting. We continued onwards and now saw quite a number of people on the hill - we'd only seen four people on the entire trip up to this point. A well graded path led most of the way to a cairn where we rejoined the ridge before proceeding to our third Munro of the day, Mam Sodhail (1181m), where there's a giant cairn. On the slopes up to MS is a ruined house! The ridge here is quite interesting, with bits carved out of it near the cairn before MS. Here I left the others, being the only one of us intent on going up the outlier, Beinn Fhionnlaidh (BF)(1005m) - lower than than those around it but proving to be a worthwhile peak. I went down to the col overlooking Loch Uaine, then contoured north to the ridge between Carn Eighe and BF. Left rucksack, zoomed down hill, plodded up to join three others on the summit of BF. Skye in all its glory; Torridon. But in particular this summit gives a bird's eye view of the Loch Mullardoch circuit, all the peaks showing clearly. I reluctantly headed back towards Carn Eighe (1183m), the highest summit in the area. Stopped for chats with three groups of people. Saw the other three on the ridge heading east. Everyone else seems to be heading west. One gent seemed to have had a Vesta meals display cabinet emptied into his rucksack. The ridge to Tom a Choinich (TaC)(1111m) was less undulating than the An Socach ridge, and the four subsidiary summits, thankfully, required little effort. There was a pleasing gendarmed section where the path by-passed some rocky spires (airy drops beside it) and it hugged the ridge less precariously elsewhere. I could see the others ahead on TaC. I think they were deliberately going slowly. By the time they had reached the col beyond that summit I had almost caught up, and I reached them just as the campsite had been decided upon on a flat promontory beside some snow, to the south of the col, above Allt Toll Easa. A selection of meltwater streams and excellent flat, dry pitches. Good views south east to snowy mountains (Cairngorms?). Cloud has been developing and after a while a few drops of rain forced Dave indoors. They soon subsided and lots of brews etc are under way. We reached here at 7 pm after one of the best backpacking days available in Scotland - five Munros*, six for Martin, brilliant views, superb high camp at 850 metres**. Rich aroma of onions from D's borrowed stove. Total ascent for the day - 1770 metres. * and ** ...NB Whilst calculating this I realised a 'minor error'. we are actually at NH 149 265 on an undulation before Tom a Choinich, camped at 950 metres (not 850) and we have an unexpected extra two miles to do tomorrow. 9 pm - now time for soup and frankfurters before it gets dark! As nobody will fetch any water for me I have to resort to my 'cleansing' water (which refreshed me considerably earlier) to provide some 'body' to the soup. It stayed light late, despite cloud. 0600 and the mist is right down. Brew up tea and porridge and pass stove to Dave. Everyone ready by 7.15. Nick admits to blisters on feet. Move off at 7.20 and come to something with a cairn on it at 7.45. Moving on, we realise it isn't Tom a Choinich. After one more cairn, we arrive at TaC at 8.40. The route down follows the fence, steeply. Bealach Toll Easa is marked by a stalkers track crossing the ridge. On into the mist to a flattish bump, then slowly upwards towards Toll Creagach. Arrive at 9.40. No view. Attempts at finishing reels of film. Down eastwards to a col, then NE through a wet, boggy glen, finishing up in a wet, boggy, heathery wood. Emerge at Generator House, then head towards the other end of the dam. Arrive at 11.30am. All day breakfast at Dalwhinnie. Nick goes his own way to Dundee. 15 mile jam on M6. Report writing for work tomorrow. Note 1: Sue and Martin were here in 2015, heading from the other direction. We descended the easy northern spur of Sgurr na Lapaich. From CnG we would recommend descent into Garbh-choire then ascent via this northern spur, if conditions are dubious. Note 2: from what Martin can remember of his 2015 visit, this is the crux of the walk, with care needed on the descent from 1086m. Note 3: When M & S were here in 2015 they ascended easily via Carn na Breabaig and Meall Shuas. Note 4: In 2015 it was a comfortably inhabitable bothy. I started this with the intention of typing a summary of the diary entries from our Mullardoch round undertaken in May 1991, almost exactly 25 years ago, but I was compelled to type the whole lot, if only for Dave and Nick's entertainment (sadly we have lost contact with John). Our diary (Volume 19) contains a photocopy of page 55 of Richard Gilbert's '200 Challenging Walks in Britain and Ireland - A Companion Guide to 'The Big Walks', 'Classic Walks' and 'Wild Walks', the Loch Mullardoch Circuit being 'Wild Walk' number 13. Brilliant books, all of them, but perhaps superseded by more recent publications and blogs. These days Munro baggers may be tempted to vary the route we followed by heading up Mullach na Dheiragain (MnD) en route to Sgurr nan Ceathreamhnan. The ridge between the two could be tricky in poor weather, in which case it may be wise to follow our 1991 route and perhaps attempt MnD as an outlier. Whilst my visits to the area have been in good weather and uneventful in terms of 'difficulties' it is clear from reading Richard Gilbert's account (and his mountaineering skills far exceed mine), that in poor conditions the route we took could be over dangerous terrain with lots of scope for mishaps. Take care! Looking at those old photos, I see that I still have (and use) a ‘waistcoat’ like the one sported by Dave, and until two days ago the green Karrimor Jaguar 65 rucksack was my primary backpacking sack, having outlived less durable replacements from Golite and Lowe-Alpine. The Phoenix Phreerunner tent is also still going strong. I must have had more energy in those days – I wouldn’t nowadays contemplate writing a report of any sort after arriving home late after an early start with a four hour walk and a 400 mile drive. Perhaps that’s how I managed to hold on to my job for so long! I’ve plotted (roughly) the route we took on Anquet mapping software and that is shown below, with the red triangles representing Munro summits. If you click on the image you may get a slightly larger version, although a magnifying glass could be handy! The route we took was about 60 km, with 5000 metres ascent.